America the Beautiful is a patriotic song that stirs the emotions. It is also hard to sing well! Download it free in six keys, as a lead sheet, or with piano accompaniment/four-part harmony. First, the lead sheets. Scroll down the page for the links to the free downloadable PDFs to print. Because the intervals of the chorus of this popular patriotic song are very tricky to sing without a piano accompaniment (for younger and less experienced singers, at any rate), it makes a good High School Choir audition song. Oh boy. NOW students can't hide! Here in Alaska, the audition for being part of the state and local Honor Choirs calls for a couple of major scales, a descending arpeggio (broken chord), and one verse of THIS song, sung with no accompaniment. What makes this song so difficult to sing without an accompaniment? I think it is the melody's use of almost all the intervals, and the temporary modulation (change of key) at the end of line two. Most particularly, starting at the end of line two and into line three, your students who are plagued with intonation weaknesses may have trouble getting back into the tonic. Those large intervals (4ths, 5ths, and 6ths) in rapid succession are tricky! This is the same arrangement you will run into in most hymnals. I do recommend having your voice students work with this piece, even if vocal auditions are a long way off! 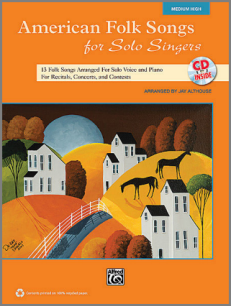 Do you need a beautiful but easy solo for a young beginning singer? Check out a simple song used in Cinderella, "Lavender's Blue"! See all the free patriotic songs on my site! Thank you for sharing the free downloads of piano music for piano students. I use your site frequently. My son has decided that the Keegan's Waltz arrangement you have is the best song ever written for piano. 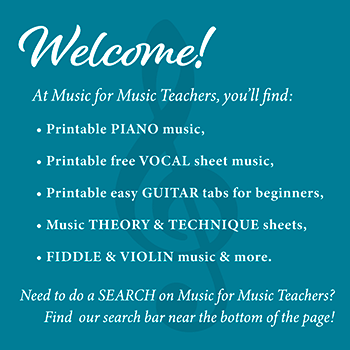 Thanks a lot for building such a nice site where people can easily find and free download sheet music for beginners. I am going to start teaching piano to kids. I was just searching for some basic interesting songs for my pupil. Here, I found a wonderful site where I spent more than 3 hours and downloaded some music. Thanks again for making my day easier.